2014 is coming to a close and 2015 is just a few hours away. As the New Year approaches, our thoughts turn gratefully to those who have helped us in our progress and the progress of our community possible. And in this spirit we say, simply and sincerely, thank you. Thank you for everything big and small you do to help make the C Diff Foundation a better resource in the lives of others, a rewarding organization to work with, and for joining us in raising C. diff. awareness to the millions of families, healthcare providers, communities, and friends worldwide. We are a giving Foundation and a lot of that giving is facilitated through each of you. Giving makes a difference and there are so many different ways to give. Whether it is through presentations at a conference, joining the Foundation’s volunteer program, or donating time in November for the “Raising C Diff Awareness” campaign in communities across the globe the partnered efforts and contributions are greatly appreciated. Through the many facets of giving and charitable support, the Foundation’s mission continues to move forward in educating, and advocating for C. diff. prevention, treatments, and environmental safety worldwide. From all of us to all of you and your families, we send our best wishes for a happy, healthy, and successful 2015! 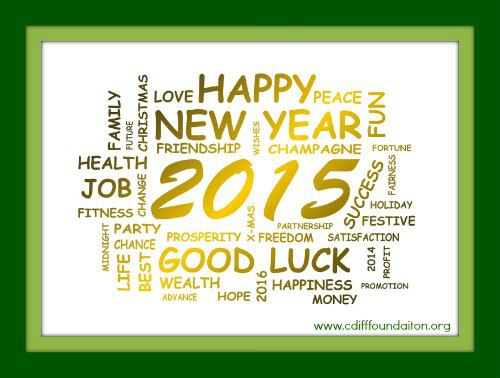 This entry was posted in C Diff Foundation and tagged 2015, c diff, C Diff Awareness, Happy New Year on December 31, 2014 by cdifffoundation.